When it comes time to order a drink, a few bar-goers stick with their tried and true favorite cocktails, you know, the same one they tried on their 21st birthday and have never ventured away from. But then you have the other type of customer that is more intrigued by the trends and expanding their horizons when they walk into the bar. These trendsetters seek out the latest and greatest in hopes of informing others of the most recent concoctions or getting that perfect Instagram picture to share with their friends. In the interest of luring these trendsetters into your bar and staying relevant in a competitive industry, we look at the trends rising to the forefront of the drink industry. Just as with the rest of the restaurant industry, sustainability is a topic that is near and dear to consumer’s hearts. Customers want to know where their drinks are coming from and if they are being sourced in an ethical way. Research shows that consumers are willing to pay for these types of drinks. Bartenders are also looking at sustainability by using their resources in the best way possible. Often times, creating a zero-waste cocktail cuts down on bar costs. Even taking steps to not use plastic straws anymore is beneficial cost wise and with customer approval. Mocktails are making a comeback. Offering mocktails at a bar might seem strange but it can be a great way to reach a whole new set of customers. But these mocktails are not your momma’s Shirley Temples. These are more complex and intriguing then just throwing some grenadine in a Sprite. Like their alcoholic counterparts, these drinks are more intriguing than ever with the use of unexpected flavors and fresh ingredients. Expect to see more sour beers than ever. Not only are sours gaining popularity, but they are getting the subcategorization they need. Beers like kettle sours, fruit sours, goses (a traditional German-style unfiltered sour wheat beer), and solera (a process of aging by which fractional blending occurs to create a finished product of a mixture of ages) will all be separated out for customers to peruse. While the flavor of sour beer’s flavor is old, American brewers have only learned how to safely produce it en masse for a little over the past five years. It draws a market for drinkers who are not traditional beer fans. People such as wine and cocktail lovers. Gin, while an old favorite for some, has started gaining an even bigger following the past several years. Gin is huge news in the Northern Hemisphere, with European gins the most in demand around the world. Gin drinkers are becoming more experimental, seeking out new flavor and ingredients. Whether it is a classic gin and tonic or a gin with new flavor infusions, you’ll be seeing gin on more and more menus. Almost everyone has needed some hair of the dog after a particularly rowdy night. Brunch drinks are here to provide that. They are a delicious antidote that is more popular now than ever. While Mimosa’s and Bloody Mary’s have long cornered the market, expect to see some new drinks. Especially drinks that feature locally produced ingredients and sustainability. 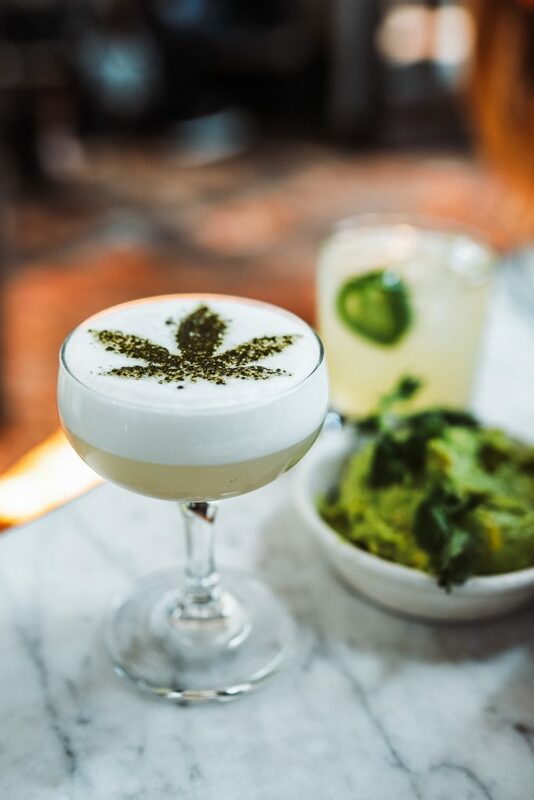 With the legalization of cannabis in some states, cannabis-based drinks have started to appear on menus. Cannabis drinks are not all about a new way to get high. 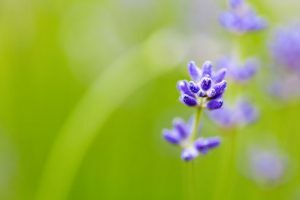 By mixing it into a drink, it will add an herbal undertone, no matter the ingredient you use. The exact flavor varies based on the strain of cannabis you use. Though it does have a surprisingly versatile flavor pairing with liquors. While it isn’t a drink, distillery tours are bigger than ever. Whether it is a bachelor party just looking for a few good drinks or someone looking to learn the ins and outs of distilling, offering tours is a great way for distilleries to increase profit. It is also ideal for creating brand awareness and loyalty. When someone tours the facilities, they form an attachment. For example, when they might have walked right past your brand at the store, now after touring, they will see it and be more likely to put it in their cart because they feel like they have some investment in your distillery. Plus, at the end of the tour, many attendees will purchase goods to remember the experience. Money for the tour, money for the goods, and increased brand awareness and loyalty. It is a win, win, win situation. Expect to see even more distilleries opening their doors to tours in 2019. While trying to incorporate all of these trends might not work for your bar, one of them has the possibility to be a big hit. Staying relevant in the industry can mean the difference between a lucrative year and having to close your doors. Have you started serving one of these drinks at your bar? Let us know in the comments below! How many times have you heard the phrase a picture is worth a thousand words? In today’s world of constant social media interaction, that saying is truer than ever. Photos, especially photos of food, have become a major part of all social media interactions, especially on Instagram. Now it isn’t like you can just slap up any old photo on your profile and call it a day. The higher quality and more interesting the photos, the more likely they are to be shared and bring customers in your door. But food photography can be challenging, so we’ve put together some helpful tips to have your business putting its best foot forward. Lighting is probably one of the most important aspects of taking a good photo. If you are able, try to use natural light with indirect sun. This will have your food looking its best, showing off its natural colors, and avoiding harsh shadows. Placing food on a table next to the window is a great way to achieve natural but indirect light. Food placed under fluorescent lighting tends to change tones and colors. While natural light is best for photos, it isn’t always realistic in restaurants where ambiance and mood lighting are important, and probably dimmer than what you would like. If your restaurant doesn’t have access to natural lighting, you can purchase some equipment to get you closer to achieving great lighting. The Wescott 43” Apollo Orb is a relatively inexpensive option that will get the job done. Tip: Many commercial table tops will be reflective. Watch out for this when lighting your photos, you don’t want it to distract from the food. Different angles capture the distinctive components of varying types of food. For example, a plate of grilled chicken and sides might be best shot from above. This will showcase the entire plate and let customers know exactly what they are getting. Items that stack, like burgers and pancakes, are better shot at a 45-degree angle. This showcases the layers and all the goodness in-between. Having photos that vary the angle also help to create variety and interest when you post them to your social accounts or use them in your menu. Tip: Try to work in triangles. Items shot in groups of three, creating triangles helps to create structure and simplicity. Staging your photos allows you to put your very best foot forward. That being said, staging should complement your food rather than overwhelm it. There are a few things that you can do to present your food in the best possible way. First thing is to make sure that the area you are taking the photo in is clean. Nothing is worse than having great looking food surrounded by crumbs or other unsightly things. It can really ruin the vibe of the photo and distract from the focal point. The second thing is to switch up your props and backgrounds. Keeping it the same all the time is going to make your photos become boring after a while. If you find yourself in a slump, you can go to the nearest hardware store for some materials with different textures that you can place your plates on. Finally, take a moment to make sure your food is looking its best is crucial. Adding a little garnish can go a long way. If you find your food looking a little lackluster, you can brush a bit of oil or water to make things look fresh. Don’t overdo it though. Tip: For inspiration on staging, find a few Instagram accounts that you love and try to emulate their work. Actions shots are a great way to diversify photos and add some interest. A creative way to get these is with a few behind the scenes photos. Your chef stirring up a batch of soup or about to slice some ingredients for your signature dish is an engaging way to let your customers see what goes on in the back and get them craving your food. Tip: Action shots are also great for adding a human element. It helps to tell your story so don’t be afraid to include hands in some of your food photos. The amount of editing you do is entirely up to you. If you choose to edit your photos, there are plenty of free or low-cost editing apps that you can utilize. Depending on the amount of time you spend taking photos and editing, you might want to consider installing Adobe Photoshop or Lightroom. These programs have long been recognized as the top editing software. Tip: Try not to over edit your photos. To much editing will look fake and potentially tacky. Just like everything else in your restaurant, your photos should work within your overall brand design. If your restaurant is a bright breakfast spot it wouldn’t make sense for all of your photos to be dark and dreary. However if you are a romantic little bistro with mood lighting, darker photos might feel just right. Before posting any photo be sure to ask yourself if it is sending the message that you want. If you are an inexperienced photographer or a pro who needs a refresher here are some photography terms and concepts to keep in mind when shooting. While following some of these concepts might elevate your photos, that doesn’t mean you have to stick to them. Use your own creativity and see what you come up with! Depth of Field: The distance between the nearest and furthest objects where objects appear acceptably sharp in an image and in focus. By adjusting your depth of field, you can really make it clear to the viewer what you want to be the focal point of the picture. 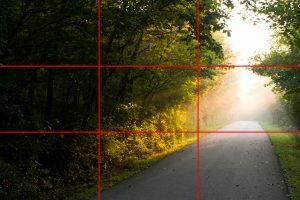 Rule of Thirds: A guideline that proposes an image should be imagined as divided into nine equal parts and that compositional elements should be placed along the lines for a more balanced photo. Bokeh: The out of focus blurred parts in a background. Exposure: How light or dark an image is. Aperture: The size of the opening in the lens. The larger the opening the more light allowed into the lens. Photos are a universal language that doesn’t need a translator. They are an effective way to communicate to customers and entice them to come to your restaurant. Food photography might seem intimidating, but by ensuring that you have good lighting, interesting content, and some creative thinking, you’ll be well on your way to showcasing your food and your restaurant in the best way possible. Do you have any food photography tips for us? Let us know in the comments! If you have been to a local brewery within the past few years, you may have noticed something a little unexpected during your visit. It might have been colorful, or had a funny name, but it definitely smelled delicious. It was a food truck parked either in front of or in a breweries parking lot offering up appetizing options. 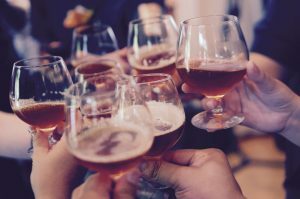 Breweries and food trucks are developing a mutualistic relationship that both can benefit from in terms of brand awareness and increased sales. The numbers for 2018 aren’t in yet, but the growth for breweries in 2017 was strong. The Brewers Association reported an increase of 6,000 breweries in 2017. While the food truck industry is experiencing revenue growth of over 300% in the last three years. Across the United States of America, these two incredibly fast-growing industries are partnering up to boost business for each other. 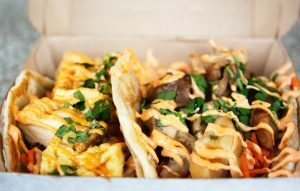 The food truck of today isn’t some shady taco truck hanging out on the corner of the street, that might have been the cause of your food poisoning that one time. These are trucks with themes, curated menus, and devoted owners and staff. Basically, a restaurant operation on wheels! Breweries are notoriously expensive to get started. 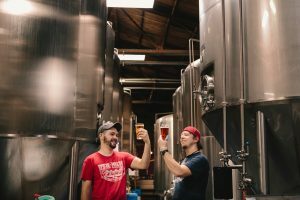 Opening your own brewery can range from $100,000 to upwards of $1 million, and once that is all paid for some brewers just don’t have room in the budget to include a full kitchen, food, and the staff to man it. This is where the food truck industry comes in. These portable kitchens are a match made in heaven for a brewery. They offer a product that helps to keep customers on the premises longer, while at the same time not being in competition with the brewery. Breweries and food trucks aren’t offering the same things, so customers don’t have to choose one over the other. 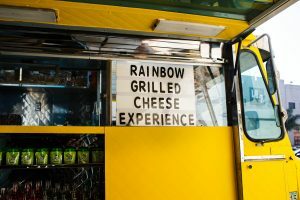 Breweries draw crowds that a food truck can take advantage of, and having a food truck, is just one more experience that a brewery can offer their customer to set them apart from the crowd. Many breweries have even developed a rotating schedule that they post weekly to let customers know what trucks will be available. Food trucks also come with their own social media following that eagerly waits for them to post their scheduled stops for the week. This is a customer base that they can bring to the brewery and encourage to try the brews. On the very same note, a brewery can have a set of truly devoted customers who wouldn’t think to try food from a Korean BBQ fusion truck, until it was placed right in front of them. It seems that the same customer that is drawn to a brewery, is also drawn to food being served out of a truck. The food truck experience capitalizes on a sense of adventure. It is new food in a different place every night. There is also a level of exclusivity that comes with only being able to serve a limited number of customers and food that can only be found at that particular truck. Customers also enjoy the personal attention and interaction that occurs at breweries and food trucks. Owners and chefs tend to be more accessible at these businesses and customers enjoy talking about the drinks and food and learning about the processes required to make the food. This works great with breweries that have an outdoor area because the truck is right there! Another benefit to food trucks is their easily customizable menu. They can adjust the menu to parallel the craft beer or wine being offered by the brewery. Trucks are seeing success using beers from the brewery to concoct beer infused burgers, or by offering pretzels created to complement the drinking process. If a food truck can create something specific to that brewery that they can sell when the truck isn’t there, such as a special drinking pretzel, even better. Breweries and food trucks can both share in the profits even if the truck isn’t on the premises. Brewery-goers tend to want salt, bread, meat, and the occasional veggie mixed in. When pairing up with a brewery, a food truck needs to consider their audience when creating the menu. An all veggie menu is probably not going to sell as well as something with meat and bread. Both breweries and food trucks have seen incredible growth over the past few years with no sign of slowing down. By pairing together, they can help ensure the success of both businesses. Do you have a favorite brewery and food truck combo? Or has your business paired with a food truck or brewery before? Let us know in the comments below! There is no denying that social media is a powerhouse. Every day new accounts are being created at a rate of one new social media user every 15 seconds. There are 3.03 billion active social media users, with the average number of social media accounts being 5.54. The average daily time spent on social is 116 minutes a day. Instagram is right at the top with over 800 million monthly active users and over 95 million photos uploaded every day. That is a huge market and a fantastic tool that you can use to reach current and potential customers. Instagram can be a powerful promotional tool if used the right way. Yelp data shows that more users are looking up restaurants based upon how “Insta-worthy” they are. There are a few things that you can do to up your game, get those double taps, and use Instagram to fill your seats. Instagrammable food in each city. Readers then flock to these locations to get that next great picture. By offering an item that is a little over the top, you can bring in a lot of business. Hybrid foods such as the Cronut, are also very popular. Don’t rework your entire menu just to make it Instagram worthy but consider creating a monthly special that is fun to photograph. It will get people in the door and it’s a great creative exercise for your staff. Presentation of food is always important, but there are a few easy ways to up you game. Investing in some white plates is a great way to show off your food. It helps to accentuate the colors of the food and has a nice minimalistic feel, perfect for photographing. Many of us can agree that greasy foods are delicious, though packaging with giant grease stains aren’t the most appetizing looking. To avoid grease ruining a Kodak moment, invest is some grease proof paper. It allows fried foods to look their best all the time. As any photographer will tell you, lighting is crucial to the perfect photo. Take a moment to evaluate the lighting in your restaurant to make sure it fits the image you want to create. Are you a dark and moody bar looking to reach college students or a light and airy bakery catering to families? If you are trying to go for a darker vibe, try having a few areas that are well lit enough for a good photo op. Neon signs can be great for this. They also create a signature piece to identify your location. Photographers love spaces with good natural lighting, it makes taking the photo easier and allows your food to look its best. You don’t need to completely redesign your restaurant just for Instagram opportunities. A few small adjustments can be made to encourage guests to take photos. A wall with a quote that embodies your brand, unique wallpapers, and furniture can all enhance the experience offered at your restaurant and promote customers sharing on their account. You can help set the tone with what part of your décor you would like featured in photos. Do you have a fancy tiled floor? Or perhaps you spent hours obsessing over the perfect counters, feature them as a consistent backdrop on your feed and customers will follow suit. Finding a mural and posting a picture with it is a new trend to hit Instagram. 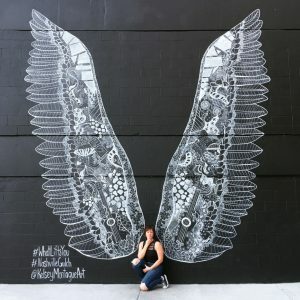 If your building has a beautiful blank wall indoor or out, consider pairing up with a local artist to create something unique to your area or restaurant. Brainstorm a signature hashtag and a location tag and you’ll have people traveling from all over to come take pictures. In some cases, people stand in lines down the block to take pictures with certain murals. If foot traffic is an issue this is a sure-fire way to increase passersby. Share your Instagram account name everywhere. On your menu, on a chalkboard sidewalk sign, or on a receipt. Make sure that your customers know where to find you online. They can’t follow if they don’t know where you are posting. Create a custom hashtag that either references the name of your restaurant or a fun aspect of your brand. This will encourage any Insta-lovers to start snapping and tagging your restaurant. Hosting a photo contest with a signature hashtag is a great way to improve engagement or get the momentum going on a new account. To encourage participation, offer customers a percentage off if they come in to eat and post. Most importantly, don’t forget to include a human element to your posts. Gorgeous photos of your food are great and can create craveability ideal for generating new customers. That being said, a huge part of the industry is the people and their stories. Integrate photos of people enjoying themselves on your feed, it’ll inspire other to come and join the food party. Just be yourself. Share photos of your customers enjoying the food or photos that illustrate the story of your business and what makes you unique. In a world of cultivated content people often crave realness. Social media is a great marketing tool and Instagram is at the forefront of the social media game. Instagram is an excellent tool for meeting your customers where they are at. By making a few adjustments to your current design or marketing plan you can increase your customer base exponentially. Have you seen results by using Instagram? Let us know in the comments below! The newest trend in the restaurant industry? Cuisine on the couch, your customers’ couch that is. The decline of customers stepping into retail stores has finally caught up to the restaurant industry with a surge in food delivery technology. Because, in the evenings, the hardest question customers want to answer is the slightly judgmental “are you still there?” from Netflix. Yes, there is normally a delivery fee of some sort, and yes, they should tip your delivery driver, but often, customers are fine with paying a little more for convenience. Think about Amazon Prime. People pay an annual fee just to guarantee their purchases arrive on their doorstep within two days. Now that’s convenience at its finest and it’s something that more people are finding desirable in their eating establishments. If a customer wants a meal from an across town restaurant that doesn’t deliver and can’t see the drive, wait time, and drive home as a valuable use of their hours, they are likely to pay for the convenience of that meal coming to them. 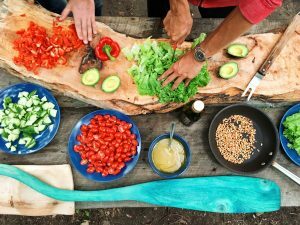 It can be intimidating to launch a delivery program, consider partnering with one of the restaurant delivery service apps that can get your meals into the hands of hungry, homebody customers. So who are the big players you need to know as a restaurant owner? Grubhub holds the bulk of the market share by being in 1,600 US cities including Philadelpia, Boston, Denver, and San Antonio. In 2013, Grubhub merged with Seamless creating a powerhouse portfolio of 80,000 takeout restaurants with the acquisition of Eat24, AllMenus, and MenuPages. The most recent reporting, according to GrubHub’s About Us page, shows Grubhub sending “nearly $4 billion in gross food sales to local takeout restaurants”. Grubhub/Seamless is noted as the delivery service of choice, used whopping 92% of the time in El Paso, Texas, and preferred in New York and Jacksonville 85% and 72% of the time, respectively. Grubhub can be ordered through both iOS and Android device apps that give customers a variety of payment options, saves your order history, and the ability to pre-order a food delivery. UberEats, it’s like Uber, for your dinner! Even though it’s a separate app, UberEats works very similar to the Uber you’re used to. Customers can order UberEats delivery in 12+ US cities from hundreds of restaurants by using their website or app to browse, order, and track deliveries. This service is available nationally but is used most prevalently in Texas. UberEats ranks as the top delivery service in Houston, Austin, and Dallas. One of the most unique qualities about UberEats is their GPS locator. Like the ride app, customers can watch their dinner make their way to them via their delivery car. For the most part, UberEats charges a flat $5 delivery fee which can be a drop in the bucket or double your cost, depending on what you order. Amazon Restaurants. You may have heard of a little thing called Amazon? It now offers food delivery through its Prime Now feature for 20 US cities and around 10,000+ restaurants, with its popularity peaking in its home stomping grounds of Seattle. But here’s the catch, this service is exclusive for Amazon Prime members. Integrating restaurant delivery seems like a natural fit; what can’t Amazon do? For those who read on an Amazon device, receive Prime packages every couple of days, and are fine with shelling out for a Prime subscription, using Amazon to order your favorite takeout probably makes a lot of sense. Amazon Restaurants is still in the beginning stages and is no small contender considering the experienced infrastructure and delivery network of its parent company. DoorDash, from start-up to starting lineup. This service is available in large regions across the US including Southern California, Minneapolis, and Atlanta. DoorDash focuses on building partnerships with national chains like Jack in the Box, Wendy’s, and El Pollo Loco. DoorDash blankets most of the market share in San Jose with 78% usage with Fort Worth and Indianapolis close behind. Of course, it’s easy to know what you want from restaurants you’re used to ordering from, but what if you wanted to try something new? DoorDash make it easier to explore the unknown with its “DoorDash Delight” system. This score rates a user’s overall experience with the restaurant’s delivery program, which can help customers decide between Restaurant A or Restaurant B. Users can order through DoorDash with an iOS or Android device. Food delivery technology has come leaps and bounds from where it was 10 years ago but this technology is still highly concentrated in major cities where delivery is second nature. It’s important for restaurant owners to understand the appeal of the food delivery technologies that are out there because they say a lot about customer preferences. Using a food delivery technology, is not always going to be the largest portion of your sales but it is interesting to add that touch of convenience for your customers. The restaurant industry is changing and evolving at a high pace, and with more pixel power than ever before, can your restaurant keep up? One of the busiest days in the restaurant industry is fast approaching, and you don’t want to be caught off guard. Valentine’s Day is the second biggest day for dining out, second only to Mother’s Day. A quarter of Americans eat out to celebrate the holiday with their special someone. That totals about 8 billion dollars spent in restaurants across the United States. What restaurant doesn’t want a piece of that? As a restaurant owner, you want to make the very most of this opportunity. What can you do to make your restaurant stand out among the competition? 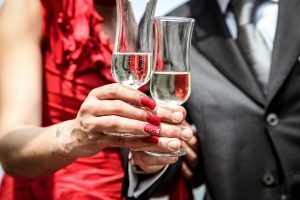 We’ve gathered together some Valentine’s Day best practices and brainstormed some fresh ideas to help you create a memorable and lucrative night. First things first, you need to think about your menu. To make it easier for you and your staff consider offering a preset prix fixe menu, otherwise known as a fixed price menu. It will cut down on wait times for guests and give you a better understanding of what needs to be ordered for the night, helping to increase your profits by lessening waste. Having a prix fixe menu can also be beneficial for customers. They know exactly what they are getting and at what cost. No unexpected surprises for either of you. As part of your prix fixe menu, consider including a starter, main course, dessert, and a recommended wine pairing. If you want to go the traditional route, try to incorporate pink or red foods into your menu and a chocolate dessert. Valentine’s Day can be a great time to incorporate some current food trends into your meals. A little bit of fun experimentation can help to set your restaurant apart from others who might be offering more traditional entrees. Perhaps offering a dessert sampler instead of a complete dessert would appeal to an audience looking for that extra special experience. 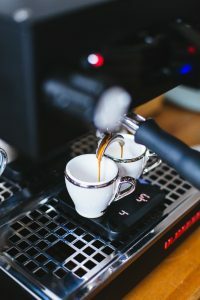 Altering your beverage service can also be beneficial for the busy day. Make sure to have suggested wine pairings available for guests who might not be very knowledgeable. Also, make sure your staff is well educated on the different wines and specialty cocktails you are offering. Fruit flavored red and pink cocktails are a favorite, but taking a risk could pay off too. Consider adding a chocolate martini with chili pepper for an added zest. Having the right atmosphere is crucial. Everything other detail can be perfect, but if the atmosphere is off, it’ll still feel like something just wasn’t quite right. Make sure to give your patrons the whole package. Dim your lights a little extra. Take a look at your music for the night and make sure it fits with the rest of your ambiance. Consider reusing those string lights you brought out for Christmas time to create a romantic lighting for your guests, or perhaps some candlelight to dine by. To help the day run smoothly, encourage guests to make reservations early. To encourage reservations, you can offer promotions, such as a free dessert, to those who book ahead. As tempting as it may be, do your best not to overbook. Consider that guests might want to take their time and linger over dinner to fully enjoy the experience. You don’t want a bad review showing up on Feb. 15th saying that guests had to wait hours, even with a reservation. Make sure that you have your A-team working. Your most experienced workers should be present in both the front and back of house. Valentine’s Day is not the time to try training a new host or waitress. Leave that for the 15th when the rest of your staff has earned a day off. Valentine’s Day is all about the specialness. Going above and beyond for the people you love. The restaurant industry is no different. You want your customers to leave feeling that they had the best food, drinks, and service. Take a moment to speak to your staff about the importance of offering an extra special experience. Try to have your most experienced servers working that night. You can trust them to give the kind of service you expect, and more experienced servers tend to be better at up selling a customer. You can also offer take home gifts for customers. A custom wine glass or even something as simple as a flower can set you up as going above and beyond in the mind of a customer. Make your Valentine’s Day specials and hours as easily accessible as possible. If customers can’t find the information, chances are they will move on to someone else who already has theirs readily available. Create a graphic and post it on your social media accounts and start a Facebook event. It also never hurts to print out some flyers and hang them around your restaurant or hand them out with receipts during January and February. The easier it is to access your important information, the better the chances you will have a full venue for Valentine’s day. If you are looking to try something new this year, we’ve got a few ideas for you that are a twist on the classic Valentine’s day meal that we all know. Wine Tasting or Beer Tasting – For those who love the beverages more than the food. Local breweries and wineries are popping up all over the United States and consumers are responding positively. Join up with some wineries or breweries in your area to offer a tasting night. Offer Valentines Meals the Weekend Before and After– Some people just can’t make it out on a weeknight to celebrate. Offer them the same meal the weekend before and after with a discount or a promotion. You can bring in even more business and will be able to offer it as an option to anyone who asks for a reservation for the 14th after you are booked up. 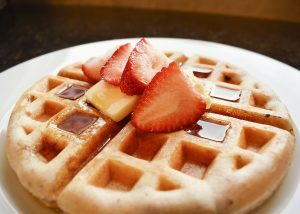 Galentine’s Day Brunch – Galentine’s Day is a day where women across the world celebrate their female friends. And what do gal pals love? Mimosas. Galentine’s Day is February 13th but you would probably do best on the Sunday before or after Valentine’s Day. DIY Dinner – DIY is all the rage and that extends to the restaurant industry. Talk to your chef and see if they would be willing to offer a class to customers on how to make their own Valentine’s dinner. What could be better than having customers pay you to make their own meal? Takeout Meals – We all have one in our lives that we know and love. An introvert, someone who works odd hours, or even moms whose only chance at a peaceful dinner is after the kids have gone to bed. You can still market to the person who wants to eat in but doesn’t want to spend hours cooking the perfect meal? That is where you come in. Offering takeout meals are a great way to continue to offer food, even after your reservations are full. Consider asking customers to order a few days in advance to give your team plenty of time to order and prepare the extra meals. Whether you stick with the traditional candlelight dinner or do something a little different, a few ideas will remain the same. Good marketing, great food, perfect atmosphere, and a staff that goes above and beyond for the customer, will make your Valentine’s day a success. Do you do something for Valentine’s day that your customer’s fall in love with every year? Let us know in the comments below. Social media is a constantly changing medium that can be hard to stay on top of. while you may be overwhelmed with the amount of apps there are out there, there is a new one that should definitely be on your radar. Recently Facebook launched its latest app called Local and it could have a major effect on the restaurant and hospitality industry. But don’t worry, we’ve done the research on this new app so that you don’t have to. You might not yet have heard of Local, Facebook’s newest venture in the app world, but you soon will. Local is Facebook’s take on the popular Yelp and Foursquare apps and a reinvention of their Events app. They have combined permanent places and events, into a single search engine powered by Facebook’s 70 million business pages, while factoring in reviews and check-ins made by the user’s friends. The goal is to help users pick between great bars on a block, and find out which one will best fit their needs and wants for that outing. 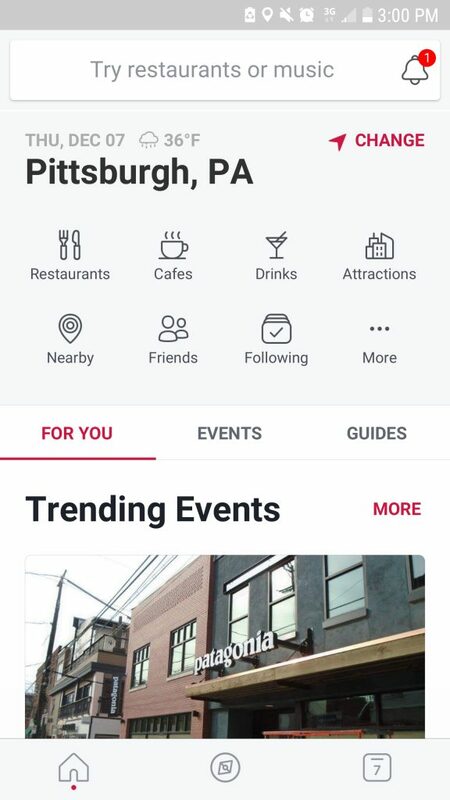 Facebook Local’s home page shows nearby restaurants, cafes, drinks, attractions, as well as the places the people you follow are going. Through the app, users can even search for a specific type of food or event. 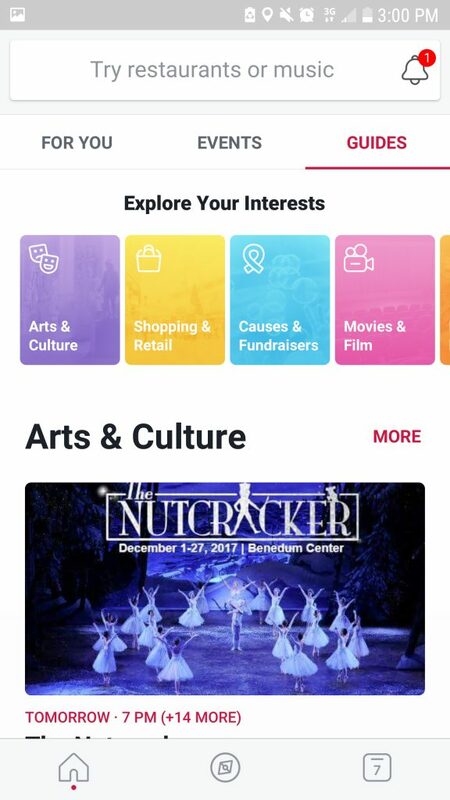 With the discover feed, users can find out what’s popular with friends and see a feed specifically curated for events they’re interested in. Once they find a restaurant or event they’d like to learn more about, they can click the page to learn all the details and even check in. Under the Guides tab users can explore their interests based upon category, ranging from Food & Drink to religion & Spirituality. Local can connect to their personal calendar to make sure they never miss an important event. Users can adjust their location when traveling so that they can find great spot and events even if they are unfamiliar with the area. The app has something for everyone. You might be asking “Why does this matter for my restaurant?” First of all, you’ll have to have a Facebook page to be included in any of the searches made in the app. So, if you don’t have a page or you don’t update your page often, you might want to take steps to rectify that. One of the best parts of Local is that owners don’t need to download a separate app to contribute to it. Simply post about different events to your Facebook business page through either the desktop or mobile app and it will also appear on the Local app. By taking a few minutes out of your week to update your page regularly, you could reach new customers. This new app can help you to reach an audience that you might not have otherwise been able to contact before. Who knows, you could have a first-time customer that found you through Local become a lifelong customer after checking their phone one night when they were bored. 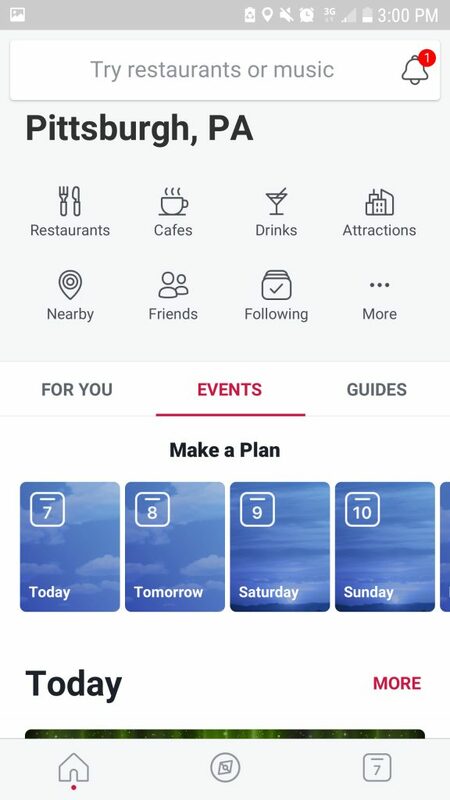 Currently, users can find restaurants through the app and book reservations if their Facebook page is enabled to do so. 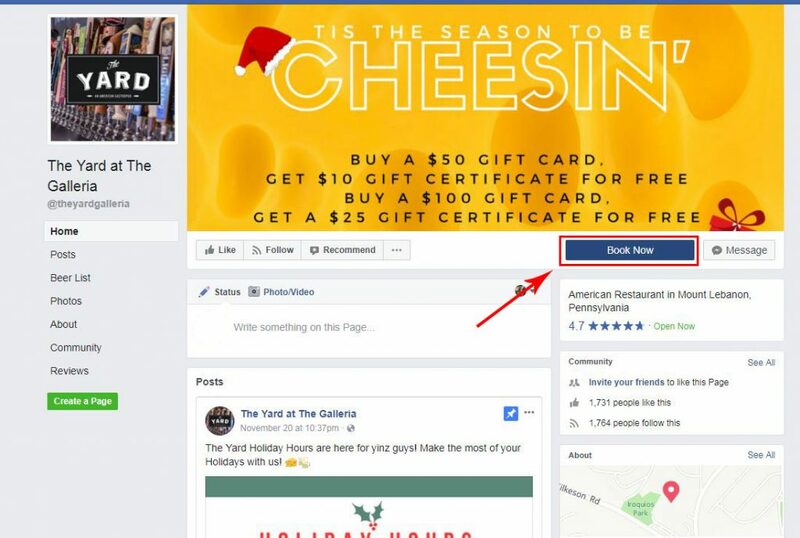 To learn how to enable reservation booking through your Facebook page, check out our step by step instructions on setting up your OpenTable Reservation Facebook App. If you aren’t sure if your Facebook page is enabled for reservations, you can check here. Currently, the app does not offer the ability to order food, but developers say that it could be on the horizon. Adding that feature would really create opportunities to increase takeout sales for restaurants. Local is still a young app so there are no certainties, but with some effort and creative thinking restaurateurs can turn this tool into filled seats, new customers, and more profit. If you have had success with Facebook’s new Local app let us know in the comments below. The phrase “customer loyalty program” often brings to mind images of punch cards and freebies, but loyalty programs have evolved through the years into so much more. Technology and data mining techniques have turned the programs from cheap promotional tactics into big data goldmines that allow smart establishments to tailor their marketing to each customer. In this article, we’re going to take a look at the different types of loyalty programs, why your restaurant needs one, and the best practices for implementing it. In the restaurant industry, there are two basic types of loyalty programs: points based systems or tiered systems. Points-based systems reward customers for dollars spent or frequency of visits, while tiered systems benefit long-time customers by awarding them special access and exclusive opportunities. To determine what type of system would work best at your restaurant, consider which behaviors you would like to reward. The numbers are in and they show that it is much more lucrative to focus on creating loyalty in your customers than gaining new customers. A study by Bain & Company reported that a 5% improvement in customer loyalty can increase lifetime profits by as much as 95%. Even more, a whopping 70% of customers who participate in loyalty programs report purchasing more. New business is great but it costs more to acquire a new customer than retaining an existing one: in some cases, up to 6 or 7 times more. Some restaurants who have implemented loyalty programs have also seen a reduction in attrition and an increase in referrals. The kind of loyalty that influences the frequency of a customer’s visits occurs when customers relate to a dining establishment. Take a look at the demographic that you would like to focus on and make sure that your business positioning and processes align with those of that demographic. Creating a customer persona could be helpful during this process. Customer personas are fictional, generalized representations of your ideal customers. For example, in a college town, your customer persona is probably an early 20-something looking for a meal at the most affordable price point. If you are located in a more family friendly area the persona might look more like someone in their mid-30’s who is willing to spend a little bit more for a higher quality meal. 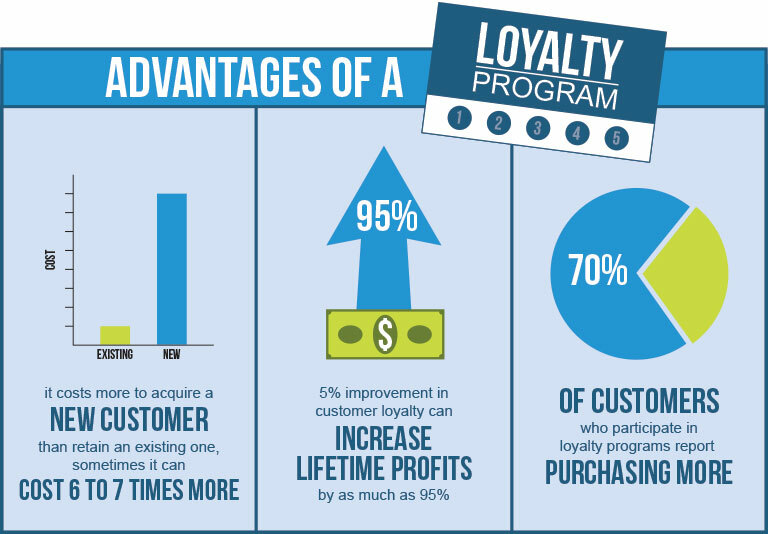 Having a loyalty program can also do wonders for collecting customer data. 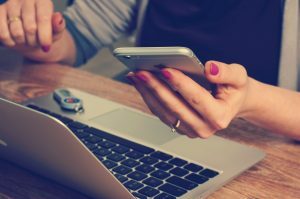 By tracking the items purchased, the frequency of visits, and dollars spent, you can determine the best areas to invest your money. Managers or owners can even take the gathered analytics to analyze the popularity of a dish and determine what other items could be purchased to pair with it and increase sales. For example, if one of your all-time best sellers is a poultry dish, you might want to consider ordering a new chardonnay known to pair nicely with chicken. You’re customers receive a better all-around experience and you see an increase in profits. These same analytics can be used to analyze customer behaviors, which can then be organized into data to develop promotions that are designed specifically to appeal to a certain group of customers. The ultimate goal is to create motivational offers to influence a customer, increasing the frequency of return visits as well as per-visit spending. That instant reward for signing up might be just enough to convince any customers that are on the fence about joining to take the plunge. Don’t force your target audience to have to scour your website to find your sign-up page. Have it in a highly visible spot as well as talking to your staff about encouraging customers to sign-up in the restaurant. Signing up should take no longer than a few minutes. Customers don’t want to spend their time filling out long surveys just to sign up for your program. Try to limit your questions to essentials like name, birthday, and email address. Loyalty programs often fail because their offerings are too general. By creating specialized incentives based on what the customer has previously purchased you are more likely to see them walking through your door. Limited time offers can be a great way to get customers in the door and increase traffic, but these strategies are not enough to create loyal customers. Spending money on these promotions may see an uptick in new customers but these are the same customers who are not likely to return until you run another promotion. Make sure your employees are well versed in redeeming your loyalty system. It can lead to frustration on both sides if customers are trying to use a loyalty program reward and aren’t able to because of faulty programming or a poor system. Your relationship with the customer is the most important thing. Customers will expect relevant offers in exchange for the personal information they are providing. It is crucial to make use of the information provided to tailor your message as much as possible. Loyalty programs may seem like they are geared more towards benefiting the customer but in the end, it is a mutually beneficial relationship. The value of the data gathered, and brand loyalty that is inspired far outweigh the costs of a few perks. By implementing and utilizing a loyalty program your restaurant could see a significant increase in profits. Running a restaurant is a big responsibility. You have employees, vendors, and customers all counting on you to succeed. This pressure is magnified even more so when there’s an unexpected crisis thrown into the mix. Whether it’s a health hazard or an earthquake, your restaurant needs to be prepared to deal with the fallout and snap into crisis mode. These crises happen without a moment’s notice and can be catastrophic if not dealt with correctly. So how does your restaurant begin to prepare for the unexpected? 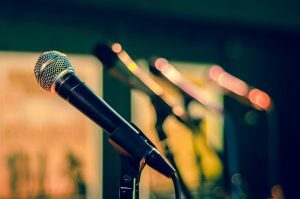 When a crisis does strike, your restaurant needs to be fast-acting to acknowledge the issue and take the appropriate steps to work towards a solution. The very last thing you want your organization to be facing at the height of a disaster is a media outrage because you didn’t make any sort of statement. There is no playing the ostrich here; you cannot stick your head in the sand and pretend your problems will go away. You need to be clear, succinct, and precise with your plan internally and to the public. This can be done with a crisis management agenda. Creating this plan can help you remain calm in times of crises which, in turn, can lead to better decision-making. 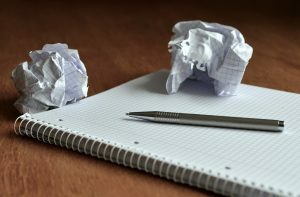 Every restaurant should have an agenda for managing critical situations, the size of which will depend on the size of your operation and the issue at hand. Brainstorm the risks faced by your restaurant such as food safety, insurance liabilities, and potential disasters (before they occur). Create a checklist or plan of what should happen when an emergency happens. Designate a task force of individuals who will carry out the step-by-step plan. Delegate tasks and information to be disseminated internally and externally of the restaurant. Identify key organizations that need to be notified such as fire, police, and ambulance services. Make a list of audiences that need to be informed: reporters, legal entities, insurance companies. Don’t forget how you plan to address employees and the public. This agenda should be shared with upper level management and designated employees that are appointed in the agenda. For an effective strategy, this information can easily be spread with Google Docs. Using Google Docs can lessen paper usage and, in case of a fire, will ensure you plan stays intact. Having a crisis management procedure in place can lessen panic and give you a roadmap for navigating the seas of this crisis. It’s without a doubt that going through a crisis that puts your livelihood in jeopardy is a stressful time. It’s also a crucial time to remain level-headed throughout the crisis. 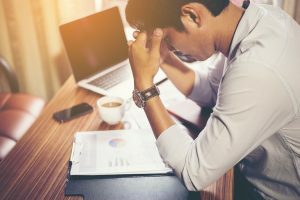 By acknowledging the issues your restaurant is facing and following your crisis management agenda, you can use your team to direct your efforts appropriately, even if you’re still in shock while the situation unfolds. Not keeping your emotions in check can cause more issues if you act on them. Instead of acting brashly, use your emotions to convey sincerity and genuine concern. Maintaining a calm and professional demeanor can not only begin to fix customer perception but also inspire a more civil view for employees. For example, Applebee’s had a tumultuous public relations nightmare in 2013. Long story short, Applebee’s fired a staff member for posting a negative comment that a customer had written (due to a privacy violation) and then praised another staff member through a post that also had the customer’s name. Applebee’s posted on Facebook stating the reason they had fired the first staff member, which invited many comments from followers. In the middle of the night, the Applebee’s social media team posted an update on the post, which got lost in the 17,000 comments currently on the post. The social media team began tagging the people who had commented and copy/pasting the update their comments, leading to more heckling and an additional 16,000 comments. The social media team could have waited until a reasonable hour and posted a new update, not a comment, instead of adding fuel to the fire. Moral of the story? Think before you act impulsively. Apologizing is not an easy step for any business, but it is a necessary evil in trying to repair the public’s trust. While making an apology, focus on being sincere. After all, what is an apology without feeling the deepest regret about the actions that occurred? With an honest-to-goodness apology to the affected parties, a business is taking ownership of the situation and can give it credibility. In making this heartfelt apology, you will also want to take timing into account. If a crisis occurs, a restaurant’s timely apology is important in keeping customers on their side. Even if your team is working behind the scenes to better the situation, it is imperative that these actions are communicated and not done in silence. The longer an apology takes, the less customers will take it seriously. Go further for your customers and add a side of great customer service to your apology. From late 2015 to early 2016, about 40 Chipotle customers were sickened from E. coli contaminants; a tough blow to a restaurant chain that prided themselves on fresh food free of genetically-modified organisms. Making an apology statement turned advertisement in major newspapers nationwide, Chipotle founder, Steve Ells, addressed the outbreaks, apologized, and made promises of more thorough food safety standards. To bring people back into its restaurants, Chipotle launched their brief rewards program, direct mail offers, and mobile promotions to earn free burritos. Unfortunately, the world can change at the drop of a hat: people make snap judgments, tectonic plates collide, and food is not handled with proper care. But that doesn’t mean your restaurant can’t be prepared to combat these crises when they happen. Having a plan, keeping your emotions in check, and truly apologizing are crucial elements in preparing your restaurant for a future crisis. Remember the best offense is a good defense. Francophiles, rejoice! The James Beard Foundation has named French cuisine a hot trend for 2017 and French restaurants are creeping back onto the scene. French cooking, with its structured techniques and timeless traditions, has often been held as the golden standard in the culinary world. But the past 35 years have been a rocky time for French cuisine, including a New York Times article claiming French food needs to be saved. 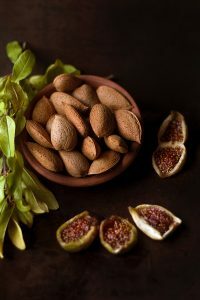 Even though French cuisine is laden with time-consuming recipes like cassoulet and gut-busting rich roux, French cuisine has fairly simple roots. Both “cuisine du potager” (cooking from the garden) and “cuisine du marché” (cooking from the daily market) are the foundations of French cooking. Food was always seasonal, fresh, and differed from region to region, creating astoundingly different regional dishes. From the beginning, French cuisine took on many different characteristics. French cuisine from the northern regions focused on vegetables local to the area, dairy products, and sausage. Southern regions incorporated richer ingredients like mushrooms, herbs, and game birds. Many chefs took these regional cuisine styles and created many esteemed cooking techniques. Sautéing, “sous-vide”, and “déglacer” are just some of the French cooking terms that have been outside the realm of the cuisine. French cooking was known around the world for its finery and strategic practices that made this an art form more than just preparing food on a plate. But many chefs wanted to move away from the heavily regimented procedures and decadence of French cuisine and come up with a lighter alternative. Lower fat sauces, the integration of more garden vegetables, and using simpler presentations began in the 1960’s. From this, “nouvelle cuisine” was born. This movement was embraced for a small period of time, but met with heavy criticism from traditionalist French chefs and food critics. By the end of the 1980’s, “nouvelle cuisine” had fallen out of vogue and many chefs returned to the more classical methods. However, other ethnic foods such as Italian and Mexican began to take center stage. French restaurants and cuisine took a hit by being perceived as stuffy; customers were more interested in other flavors and combinations. Even many French chefs began going the safe and less expensive route, giving up their quest for Michelin stars, and focusing on the basics. Most recently in 2014, the French government has tried to let consumers be aware of a restaurant’s quality of food with a “fait maison” logo. This logo would indicate whether a restaurant’s food is in fact “homemade” or not. In an effort to reduce costs, many restaurants in France were relying on industrial caterers or external food service providers to prepare food. While this is done by many restaurants internationally, it does take away from the integrity of French cuisine, which was once upheld has the standard for all culinary traditions. The many exceptions to the “fait maison” make it easy to circumvent as well as receiving a large negative backlash from food critics and chefs. Even though it seems French cuisine has toppled from its pedestal of grandeur as of late, this trend is on the watch list for 2017 and is making a comeback. Many classically-trained chefs around the country are looking to restore the name of French cuisine and others are bringing their own flavor on the great classics. Once housing a saloon and then steam laundry business, Thomas Keller’s French Laundry continues to make history on Washington Street in Yountville, California. French Laundry has been dazzling palettes with its tasting menus (which change daily) and wines since 1994. Even with a decline in formal French dining, Keller’s restaurant has succeeded over the years and is a testament to his expertise. Among winning the “Five Diamond Award” annually since 2005, Thomas Keller is the only American-born chef to have three star Michelin ratings for two different restaurants (French Laundry in Napa Valley and Per Se in Manhattan). French Laundry has set high expectations in French cuisine for restauranteurs, service, and patrons. Combining the words bistro, gastronomy, and economic, and all that they mean to French cuisine, chef Martial Noguier opened his first independent restaurant Bistronomic in 2011. While Chicago is becoming a food capital, Bistronomic is right there and relevant as ever with its comfortable atmosphere and Midwestern ingredients. Noguier keeps classic items on the menu with a regional twist in the maple leaf duck breast a l’orange and escargot with breadcrumbs. Making French cuisine seem approachable is quite an understaking, but Bistronomic and Noguier pulls it off. Shaking up the traditional white-tablecloth atmosphere of many French eateries, Petit Trois is Los Angeles’ exclusive but approachable bistro. With a “bar á la carte” menu style, Petit Trois focuses on simple French dishes such as escargots and omelettes with simple wines and cocktails. Opened by Ludo Lefebvre, Vinny Dotolo, and Jon Shook in 2014, this bistro champions no-frills French cuisine with a relaxed feel- no stuffiness here! With a no reservations policy, the 21 bar stools are up for grabs to the early bird. Petit Trois has landed at the top of many “best of” lists, including “2015 Restaurants of the Year” by Food & Wine. It is rumored a second location will be opened in the California’s San Fernando Valley. Cities around the United States are seeing the return of French cuisine in the forms of fine dining and casual bistros. French cuisine is even making its way back into the steel city of Pennsylvania, Pittsburgh. New ownership transformed what was the former Notion Restaurant on South Highland Avenue, into chef Andrew Garbarino’s The Twisted Frenchman in 2015. Up-and-coming on the restaurant scene, Garbarino has to rely more on his food than his name to bring guests in. With its food described as “modern French”, The Twisted Frenchman’s menu is peppered with game birds and quintessential French entrees. Lovingly referred to as “foie gras PB&J”, this appetizer is Garbarino’s signature and gives a contemporary take on an otherwise classic dish. In the mid-20th century, there were six luxury restaurants that ruled New York City and held the standard for French dining. Since 2004, all except one (La Grenouille) have closed their doors. The white table clothed finery of these establishments lives on and served as inspiration for chef Daniel Rose’s Le Coucou, opened in 2016. Along with Stephen Starr, restaurant extraordinaire, Le Coucou is an encouraging sign of fine French cuisine reigning once more. French delicacies line the breakfast, brunch, lunch, and dinner menus, including the cheeky “tout le lapin” (all of the rabbit). While this is Rose’s first stateside restaurant, Le Coucou is the resurgence of fine dining for local New Yorkers and tourists to share in alike. To many of Le Coucou’s patrons, this isn’t a resurgence; this a whole new experience.